#2 "P.I.S.C.E.S. 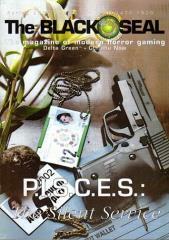 - The Silent Service"
THE BLACK SEAL #2 focuses on the UK's Paranormal Intelligence Section for Counter-Intelligence, Espionage and Sabotage - PISCES - as featured in Pagan Publishing's award winning DELTA GREEN: COUNTDOWN sourcebook for CALL OF CTHULHU. PISCES: Her Majesty's Watchmen by Adam Crossingham - this article further explores PISCES and documents its involvement in British espionage since World War 2. This article is cleared for players to read. Missing Person...: PISCES' Magonia Facility by David Conyers - this article details PISCES's scientific lab and prison located in the Atlantic Ocean, and how to get there, and get out if necessary. Unusual Suspects: Wilbur Bromley by David Conyers - Magonia's most infamous inmate is just bidding his time until the time is right. The Avengers: Off-beat espionage in the Swinging Sixties by Davide Mana. Davide explores the what-ifs of a supposedly fictious section of British espionage. Dangerous Places: RAF Hobwood & Stranger's Race by Nick Brownlow and Rik Kershaw Moore. A haunted former RAF airbase and a sleepy village are examined. Perfidious Albion: PISCES operations in the United States by Graeme Price. You thought that PISCES was limited to the UK? Wrong! PISCES is a world-wide operation. Here Graeme details it's clandestine attempts to spy on Britain's closest ally. Tales of Terror: A Stylish Death, Mind Games, & The Wrong Man by Andy Bennison, Nick Brownlow and Brian Sammons. Three short scenario ideas. Strange Histories - four alternatives to PISCES for Cthulhu Now games by Nick Brownlow, Tobias Cooper, Adam Crossingham and Rik Kershaw Moore. Meet the Black Lodge, the Committee for Imperial Security, the Directorate of Social Intelligence and Government Intelligence Section 19, four replacements for PISCES if your keeper does not want to use it or does not have access to Delta Green: Countdown. The Penhew-Carlyle Foundation by Daniel Harms. The author of "Encyclopaedia Cthulhuiana" updates the Penhew Foundation from "Masks of Nyarlathotep" for the present day. Not all ancient evil was defeated in the 1920s. 13 Places of Interest in Brichester by Nick Brownlow. Nick examines several lives and places in Brichester and uncovers mouldering evil. An interview with Gary Sumpter. The author of the forthcoming "Arkham Now" talks to the Black Seal about that project amongst other things. The Further Files of Prof. Emerson Grant by Graeme Price. Delta Green's resident professor of the weird relates another strange case: the Peruvian Mummy. Reviews. Plenty of reviews of books, DVDs and games. Investigator Templates. Profiles and investigator templates for the UK's Environment Agency, Serious Fraud Office, Royal Military Police Corps, PISCES, IRA and UDA.